20th July 2011 – Allotment Plot 326 – Harvest: 4 x Courgettes = 1lb 13oz = 640g; Shallots Red Sun = 1lb 7oz = 640g; Peas = Ezeta’s Krombek Blauwschokker = 10.5oz = 290g, Oregon Sugar Pod II = 2oz = 40g, a mix of Kelvedon Wonder, Ambassador and Meteor = 3oz = 80g. 21st July 2011 – Allotment Plot at MERL – As Ella Montt arrived at the Plot, menacing black clouds over-head, opened and vertical raindrops fell to Earth in profusion. Ella Montt went to the Library Reading Room to ponder rock phosphate, which is used as plant fertilizer, and is also a “non-renewable” resource that is in danger of running out (like oil), because of human consumption. Earth as a planet is a living thing, and it is possible that it can regenerate its self and produce more oil and rock phosphate, but how many thousands or millions of years is needed to break down and compress enough vibrant matter to renew these resources that have been depleted so recently? Ella Montt looked out of the window across the garden towards the Plot. It was still raining. The pollen on the plants flowers was wet. The Bees were hiding trying to keep their wings dry. Humans who use non organic methods of cultivation can contribute to the decline in Bee populations by using common household insecticides that contain ingredients that are toxic to Bees. The rain continued to fall. Harvest: mix of the first Climbing Beans = 40z = 120g. 24th July 2011 – Allotment Plot 326 – Harvest: 1 x Courgette = 7oz = 200g; Potatoes Madeleine = 2lb 14oz = 1.31kg; 2 x Plum Victoria = 3oz = 80g. 28th July 2011 – At Allotment Plot at MERL, it was pleasantly warm. 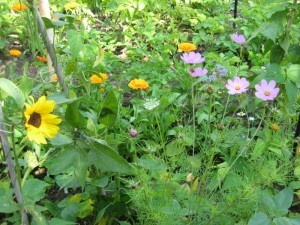 The Companion Planting, particularly the orange Pot Marigolds were flowering vibrantly. Sunflowers co-existed next to Cosmos. Mint and Strawberry runners were making their way across the Plot, establishing new plants at punctuated points of root construction. The Plot was in need of water, so Ella Montt fetched the watering can. 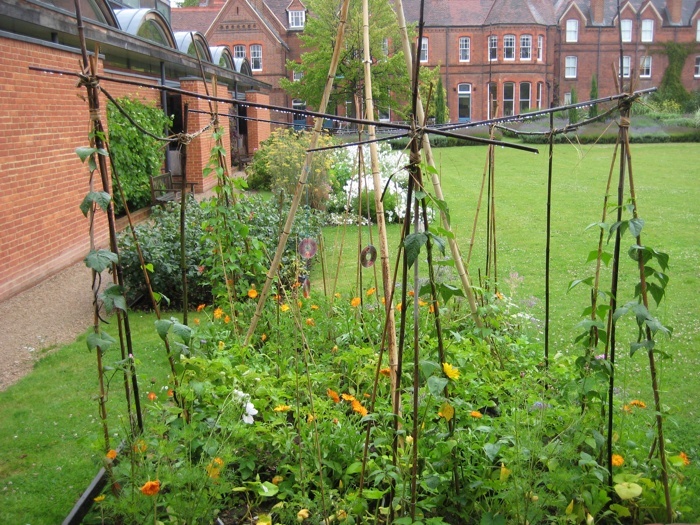 Tomato, Squash and Climbing Bean plants were also opening their petals to receive winged visitors interested in taking part in their sexual reproduction process that will lead to the Plants becoming bearers of fruit. Although it was summer, the nights were still sometimes very cold for the time of year. Cold temperatures at night can be a plant growth inhibitor. Ella Montt scattered Rocket and Wild Rocket seeds near the Celery. Two Jays and a Magpie attempted to visit the Mulberry tree. Ella Montt made a signal to EB, (who was leaning out of the window), that the Potatoes would soon be ready for harvesting. EB nodded in return. Harvest: a mixture of Climbing Beans = 7oz = 200g; Rainbow Chard = 2oz 50g, Mint and Sage. 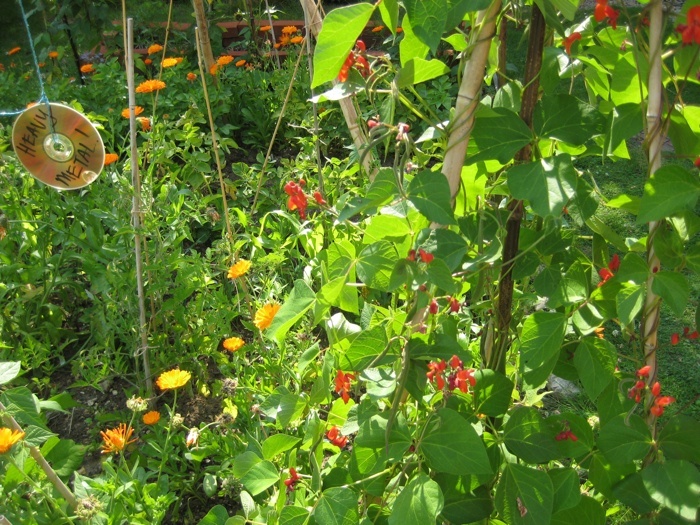 29th July 2011 – Allotment Plot 326 – Ella Montt pulled up most of the Pea plants and placed them in the compost. On the soil, where the Peas had been growing, was empty Pea pod shells, left by other Beings that liked to eat Peas. Harvest: a mix of Peas = Ezeta’s Krombek Blauwschokker = 1oz = 40g, Oregon Sugar Pod II = 3oz = 80g, a mix of Kelvedon Wonder, Ambassador and Meteor = 3.5oz – 290g; Dwarf Beans Royalty = 1oz = 40g; 5 x Courgette = 4lb 6oz = 2kg. 31st July 2011 – Allotment Plot at MERL – Harvest: French Bean (Climbing) Blue Lake = 0.5oz = 10g, Blauhide = 0.5oz = 10g, Neckarqueen 1oz = 20g; Runner Bean Enorma = 1.5oz = 35g. 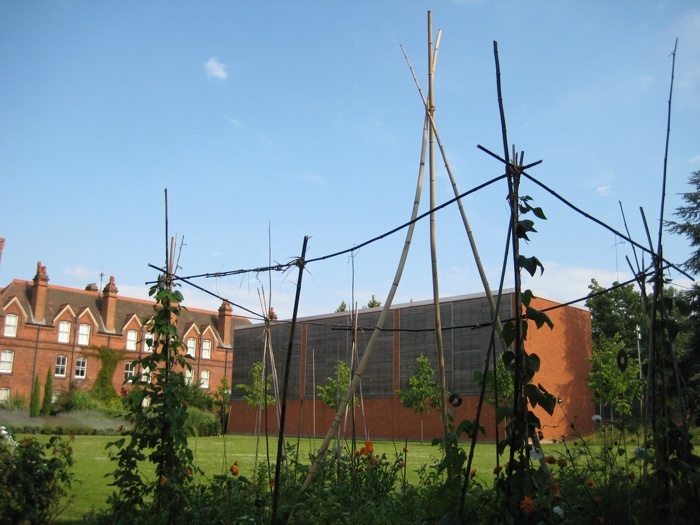 31st July 2011 – Allotment Plot 326 – Harvest: 4 x Courgette = 2lb 2oz = 900g. This entry was posted in Allotments, Harvest and tagged Allotments, Harvest, MERL, Plot 326, Rain on August 3, 2011 by katecorder.